The newly-crowned Princess Wanderlust Scarlett has tagged me for a most glorious Christmas meme–to write about 12 of my favorite Christmas things. I’m choosing to write about 12 of my favorite Christmas memories over the years. I will fulfill my meme-ly duties in due time, but for now, Scarlett’s tag reminded me of a general Christmas memory post that I put up last year around this time. If you’ve read my 100 things about me, you know that my parents were divorced when I was very young. And so, I’ve been in the shoes of Tadpole–having adults around me trying to make everything seem normal when, it turns out, I suppose it wasn’t (whatever “normal” means anyway). But I’m sure the bigger reason was that with two full holidays, nobody missed out on a family Christmas experience. In fact, as kids, we were blessed with double the fun. *These are not the actual recipes my Mom uses. As you can surely understand, these are top secret and under heavy guard. I did, however, try to find some that are close to hers. Are you sure that you didn’t have anything to do with the bows? Nice post. Very funny photo!!! Bet you wish someone would just drop him off at the post office and send him for Christmas- it could be your present!!! *Anna, too funny, and it would be even funnier if you weren’t right! Your post warmed my heart. Because I can relate. My parents divorced when I was a baby. I don’t even remember them ever being together. But their one success was that they wanted their daughter to have as normal a childhood as possible and they did that. I always felt very special because they always made me feel loved. Thank you for bringing back good memories! Oh we had two Christmases too! The same goes for just about all the holidays. My parents got divorced when I was between first and second grade. My dad moved around quite a bit, and wasn’t usually around, and when he was we met at his parent’s house, so then even when he wasn’t around we still went to their house, every other weekend. So Nana and Pop got us Christmas eve, which we celebrated as Christmas, and got us the day before, or the day after, or weekend after all major holidays (Easter, Thanksgiving.). Only getting the fourth of July on the actual date. (though I do think they got us some Easter mornings, they just had to send us off with our mom for the rest of the day). 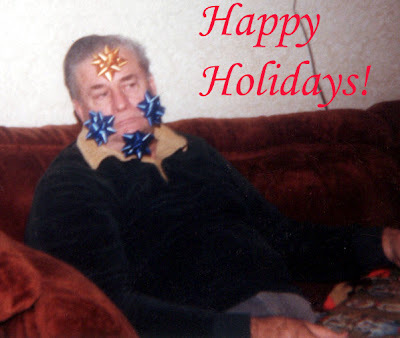 After College, off and on, I lived with my Nana and Pop, and to her dying day, she still complained that they didn’t have us all to themselves on any holiday, and how sad it was how often they had to pick other days then the actual holidays to celebrate with us. I tried to explain that they didn’t really have custody, my dad had partial but was never around, so my mom wasn’t being stingy, she didn’t really have to let us spend any holiday time with them at all. This did nothing to make her feel better. I guess what I didn’t understand was that their son was away (and their daugher had died), and every holiday on the actual day they didn’t have family festivites, so they felt gipped. My brother and I, on the other hand, got two Easters, two Chrismases, and two Thanksgiving dinners. We were quite happy!! When my Nana and Pop died, it went to just one celebration for each holiday ( I miss them and the love and magic they brought into my life). My brother, however has managed to still have two celebrations. He has to go both with his wife to her family funcitons, and then bring her and the kids to ours. And since no one’s mother will surrender the day, he goes to one for the first half of the day, her family’s, and then to ours for the second half. My mom is always saying “are you sure you don’t want more turkey?” and he is always saying “I just ate!”. I hope neither of your parents felt gipped! This was a beautiful post Sognatrice! It’s wonderful that your parents managed to not only make you feel “normal” (whatever that is, as you said) but even a little more special than the other kids, who only got ONE Christmas. And that photo of your grandpa? Priceless! I can’t even imagine having two. One is more than enough to cope with. *Tarie, well I’m happy that you’re happy for this year! Woohoo! *NYC, time to start making our own traditions, eh? Sognatrice, you naughty girl! I can’t believe you wrote that! *giggle/blush*… sheesh… you’re getting chocolate coal in your stocking young lady! Love the rest of it… Christmas memories and things that are so sweet and special… real precious moments that live within us forever… so good. Thank you. And, that photo of your grandpa is something else, WOW! What a good sport, and what lovely holiday spirit. Think you could get one of P like that? I love the photo. I’m sure it made it even more memorable because it was out of character for him. I love thinking back about childhood memories. Like you, I have so many fond ones and they do give me a warm fuzzy feeling. Hats off to your parents for being able to remain friendly. It’s an example we can all earn from. Sending heaps of Christmas cheer and joy to you and P.
and . . . i’d love to do the meme if you have a free slot. *Scarlett, I have *no* idea what you’re talking about 😉 I’ll have to see if I can get P to pose with bows, but I’m not holding my breath…. Comment # 4 to explain why I left 2 and then 3……….oops! Then I saw the third appear, oh dear! Now I must leave a fourth to “expalin myself”. Which I probably made of mess of anyway. I know you will understand, as you know how these *things* make me cookoo. I heart Christmas miracles. Great picture. Very sweet. That is one of the funniest pictures I’ve seen in a while. I’m thinking, you holiday cards for next year? It’s just perfect. Your grandfather looks like he was quite the character! Is this the same grandfather that thought Kit Kats were more cookie than candy? ADORABLE! I had two Christmases every year as well. It actually worked out perfectly because my dad is Swedish and Swedes celebrate Christmas on the 24 Dec. Mum then had me pretty much to herself on the 25th. I do, however, rememeber some nastiness over Thanksgiving (we lived in the US then) and other holidays. It was kind of a turf war and really horrible for me as a kid. Once I had to eat two Thanksgiving dinners on the same day. And each parent wanted me to eat large portions and not “save room” for the other. Well, just thought you should know that today was a snow day for us, which prompted me to make some cut-outs with the girls, which in turn made me think of decorating cookies at your mom’s, which made me think of you, which made me check out your blog, which made me read the Christmas blog, which happened to mention Christmas cut-outs at your mom’s (see a pattern here? ), which made me finally post a comment! I often long for a good slumber party. They are some of my most favorite memories! I miss you. By the way, the cookies we made….not so good. The girls are 5 and 2 after all. *Hey! So happy to see you here! Some memories those slumber parties…and soon your daughters will be ready for them. You think they’ll make mountains of sofa cushions to jump into and record themselves both extemporaneously and performing skits on pink boom boxes? Thank you so much for entering the contest (and for that wonderful story!) and good luck! Voting begins soon; don’t forget to send your readers over to vote for you!